This is an actual ad that ran in our grandparents’ day, advising moms everywhere that they are doing the right thing, the healthy thing, by feeding their babies soda. Because it’s wholesome. It’s pure. Pure what… sugar? Is it wholesome because it’s clear? You really have to wonder what kind of crap was in the non-pure sodas back in the day. Battery acid? Crack? Because I’m trying to picture what’s worse for a newborn to drink than sugar syrup with a bunch of citrusy chemicals in it and that’s what’s coming to mind. Wow, times have changed. In case there was any doubt, the past season of Orange Is the New Black featured child soda-guzzling as a major part of Tiffany “Pensatucky” Doggett’s backstory. They flash back to Tiffany as a small child, showing how her abusive mother fed her a gallon of Mountain Dew before going into the welfare office, hoping she would qualify for more government assistance if she had a kid with ADHD. Later, Tiffany becomes a young woman with incredibly low self-esteem, who will prostitute herself for a six pack of, you guessed it, Mountain Dew. As fans will know, Tiffany’s life then hits a downward spiral into meth addiction, multiple abortions, murder, and finally, prison. By the end of Season 3, Tiffany is showing some drastic improvements in outlook and character, which hints at the idea that she wasn’t so bad by design. She just had the wrong environment, wrong family, wrong circumstances, and apparently, the wrong beverage growing up. I’m not saying that OITNB is pointing the finger directly at Pensatucky’s childhood Mountain Dew consumption, but it definitely becomes a symbol of the abusive, white-trash upbringing that leads to her later downfall. 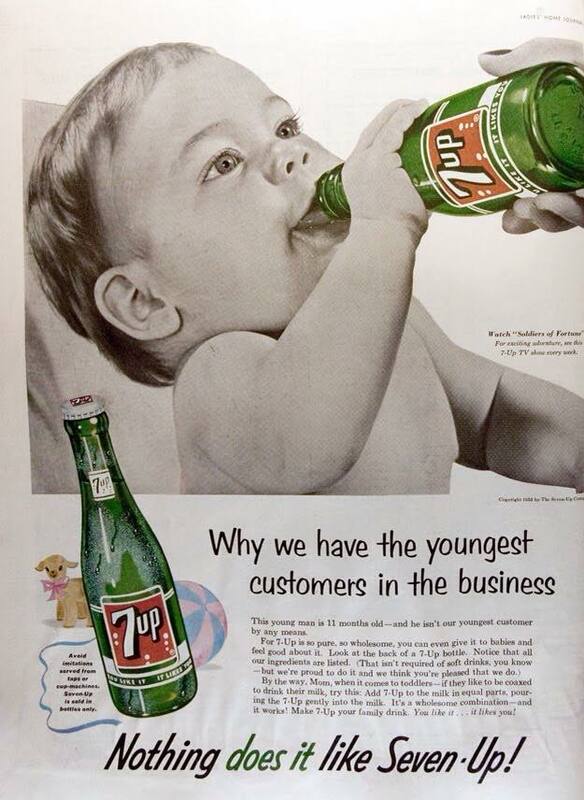 It’s a far cry from 1955’s idea that good mothers feed their babies pure soda. Back then, moms didn’t worry themselves sick about everything they put on the table. For breakfast, they just fried up some bacon and eggs, without any thought to saturated fats and cholesterol, then slapped a tub of processed margarine on the table for extra grease. Or maybe handed their kids some multicolor sugar smack cereal or a PopTart. Whatever got them fed. Parents didn’t fret about TV dinners, processed cold cuts, or sugar content back then. They more processed, the better. With a name brand you can recognize, they knew they could trust the food. It probably means it’s clean. Hell, they were just happy that modern food science had liberated them from their grandmother’s drudgery of making food from scratch. “Convenience” was the name of the game. Growing up, my cousin and I absolutely lived off of Day-Glo orange Otter pops, and I can’t imagine what kind of chemical cocktail went into making those. Our grandparents used to give us each a couple bucks and send us walking to the nearest candy store, by ourselves, to fill a bag with whatever caught our eye. We even bought bubblegum cigarettes. Then we would walk back home and just hang out in the backyard, wolfing it all down at once. My grandparents’ biggest concern, at the time, was whether we would smear melted Charleston Chew chocolate or Chick-O-Stick crumbs on our clothes. Nowadays, they game has changed. We no longer trust anything easy and are constantly on the lookout for harmful ingredients: high-fructose corn syrup, trans fats, artificial colorings and flavorings, MSG, Saccharin, Aspartame, Splenda, sodium nitrate, BHA , to name a handful. And that doesn’t even include the packaging. We are convinced we must ferret out these substances from our children’s food before they cause everything from heart attacks and emotional instability to brain damage. The more stringent parents don’t stop with artificial additives. Some won’t cook with red meat, butter and whole fat milk or cheese. Others ban dairy entirely, along with white sugar, flour, rice, pasta, and bread. You might think we could all agree that at least water is safe, but a number of parents are concerned about the effects of fluoridation. All in all, it’s absolutely exhausting. Don’t get me wrong, I’m on board with the clean eating movement and try really hard to feed my kids well. I blended up all my baby food from scratch, get fresh produce from farmer’s markets, try to minimize the amount of processed foods my kids eat, and usually cook all of our meals at home, from scratch. But sometimes, every once in a while, I’m a little jealous of moms from previous generations. They never worried about all this crap. They just pulled out some Wonder bread, smeared on some Jiffy peanut butter and Smuckers grape jelly, and called it a day. Absolutely right about “those days!” OMG to the soda ad wow! I was so shocked when I came across that ad that I talked to my mother and grandmother about it! They remember that stuff well. I think it’s good that people are more aware of healthy eating now, but I also think we can get too worried sometimes. Lots of people have “no candy” Halloween parties for kids now, and I think that’s awfully strict. Think I’d love to reblog this info! Poison as food; it’s the American way…what sickens me is that the beverage companies buy the laws that let them continue to push diabetes, heart disease and loss of concentration and their junkies are the first to defend them. Very true… What’s best for business often overrides what’s best for people (usually my with the word “freedom” used in defense). And those who criticize it are often considered food snobs, but what’s happened to our food supply is criminal. You really have to bend over backwards to eat well in this country… Something that’s become even more important to me after having kids.